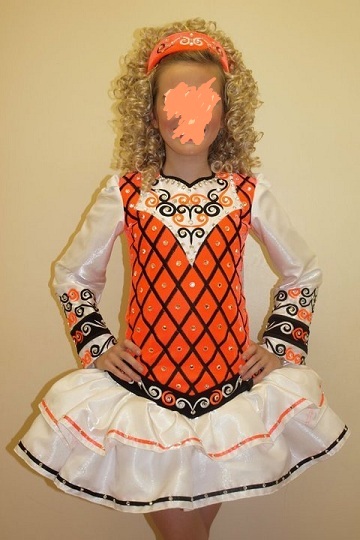 Beautiful Shauna Sheils/Doire Dress Design Championship Costume. Just 1yr old . Worn by slim dancer. Orange velvet bodice with black embroided crisscross design. White neck inlet with orange & black embroidery swirls, trimmed with black satin & swarovski crystals. White satin sleeves, finished with black & orange swirls. White ra ra skirt, trimmed with orange & black ribbon. 100’s of swarovski crystals. Includes matching headpiece, shawl, kick pants & carry bag. Asking Price: €750. Shipping costs are included for my own country, overseas shipping is extra. Sale is final.